Varicose veins are swollen and enlarged veins and they usually occur on the legs. They affect both men and women equally. Varicose veins may be blue or dark purple and very often they are lumpy or twisted in appearance. Around 25 percent of adults have varicose veins. Beside their obvious appearance, other symptoms for varicose veins are heavy and uncomfortable legs, swollen feet, muscle cramp in your legs, thin skin over the affected vein, aching etc. For people who have varicose veins, exercise is something what they must to do every day. Weight is something that need to be maintained and healthy diet is a must, plus you must to pay attention on what you wear (avoid high heels). Also long periods of standing and even sitting need to be avoided. Beside all this self-management treatments, natural remedies are another thing that may help when it comes to varicose veins. Calendula, also known as marigold is a extremely beautiful plant, native to southern Europe and southwestern Asia. This edible flower, beside in culinary it’s also used for cosmetic and medicinal purposes. 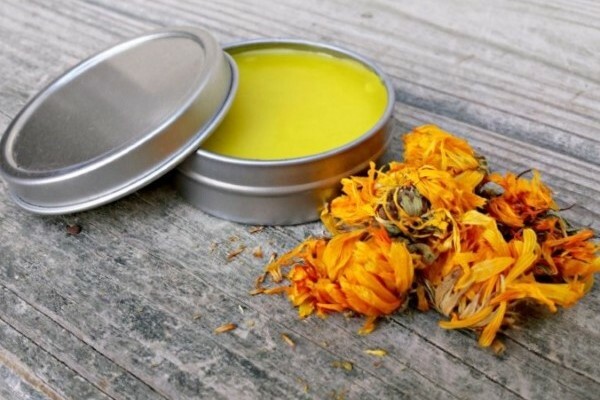 When it comes to medicinal uses, calendula is used in many natural remedies, tinctures, herbal ointments, teas etc. for more than a century. Cuts, bruises, burns, blisters, muscle spasms, fever, sore throat, inflammation, varicose veins, stomach ulcers, menstrual cramps etc. are some of the health problems that are threatened with help of calendula. Beside all this health benefits, it has been found that this plant has the ability to purify the blood vessels, relax and increase their lumen, as well to reduce high cholesterol level in the blood, especially when is in combination with dandelion and hawthorn. Some researches have found that beside ability to reduce blood pressure, it also acts as a mild sedative because it relieves blood vessels and increases their lumen as we said, which is why it is recommended for angina pectoris (stable angina). In this article we present one remedy, an ointment for varicose veins. First, in medium size pan, melt the lard on low heat. When lard is completely melt, add the calendula flowers together with chestnut shells and stirl well for few minutes. After few minutes, remove the pan from heat and let it stand for 5-6 minutes and stir constantly for all that time. After this cover the pan and let it overnight. The following day re-put on low heat with constant stirring until it melts completely and when everything is melted well, drain the liquid into a glass jar through sterile gauze and keep the jar in dark and dry place. Use this cream once per day. Massage gently into affected areas. If you are vegan you can also prepare calendula oil for varicose veins following the same recipe and procedure, just swap the lard with some vegetable fat, such as olive oil. Everything else is same. If you find this article useful, don’t forget to share with your friends and family, keep in mind Sharing Is Caring.